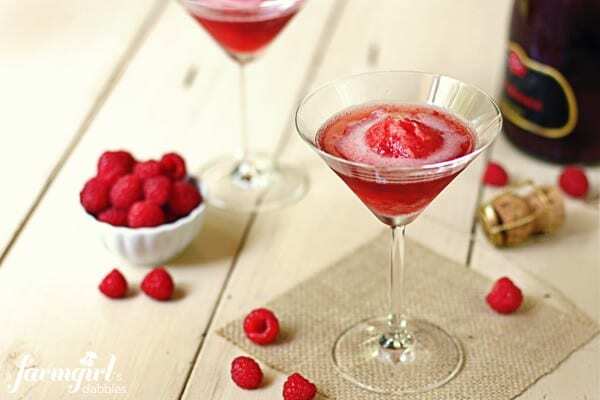 Just a little scoop of its sweet summery goodness in a small glass topped off with a sparkling beverage – alcoholic or NA…these Raspberry Sorbet Bubblies have been making me smile. If you already have your raspberry sorbet frozen in the freezer, there really couldn’t be a much simpler dessert to serve than this. Just open up your choice of bubbly(s) and pour! I came across many intriguing sorbets that incorporated alcohol right into the frozen sorbet. But I wanted more freedom with it…to be able to enjoy it without alcohol myself, and to be able to serve it to our young girls. Hatti and Tessa love to sit at the counter with their half-pint jars of sorbet and share a bottle of soda between the two of them. It’s such a bright and happy dessert! 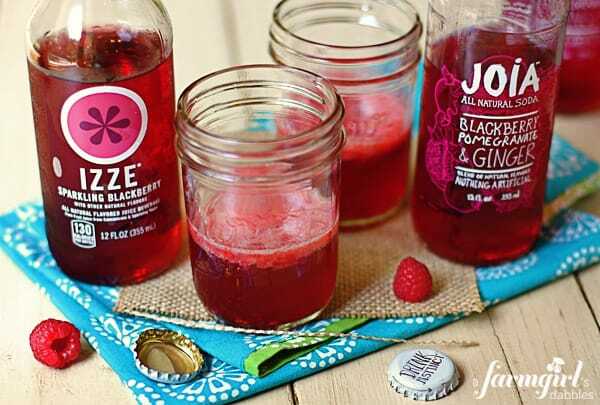 The girls and I are huge fans of Izze and Joia fruit sodas, and they go so swell with this raspberry sorbet. 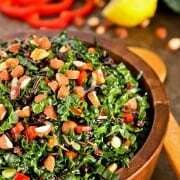 Do you know about Joia sodas? They are a relatively new bottle, hailing from right here in Minnesota. Joia offers a bit of sophistication to sparkling fruit drinks, mixing fruits with herbs and spices. Like pineapple with coconut and nutmeg. And my personal favorite, grapefruit with chamomile and cardamom, which I find ultra crisp and refreshing. Check out their website for Joia mixology ideas and locations where you can pick up some for yourself! About 15 minutes prior to serving, take the sorbet out of the freezer. 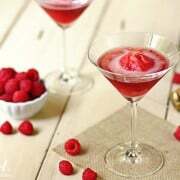 Place a small scoop of sorbet into a small glass – I like to use martini glasses or half-pint canning jars. Add your choice of bubbly. Garnish with a few fresh raspberries, if desired. A small spoon is sometimes nice, too, to scoop up the delicious sorbet. Enjoy! Inspired by my friend Shaina Olmanson’s very delicious “Peach Granita Bellinis” in her new cookbook, Desserts in Jars. Yum! This looks delicious. We will have to try it out. The photos are beautiful, thanks for sharing! I will definitely be ringing in the new year with bubbly and this looks like a very refreshing variation! This is my kind of drink! lovely! Thank you, Russell – such a fun way to celebrate summer! These look so fun and totally delicious. Thanks for sharing your raspberry sorbet recipe and the idea for these bubblies! This recipe looks fantastic! I am actually hosting a raspberry linky party at http://www.2sisters2cities.com/2012/07/fresh-produce-tuesday-raspberry-recipes/ as part of our Fresh Produce Tuesday series. 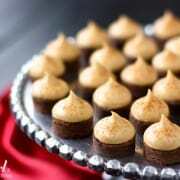 I would love if you submitted this recipe! so refreshing, perfect for summer! NICE! I think I’ll make a batch for the kids and a separate batch for the grownups! Such a gorgeous drink! Love it! 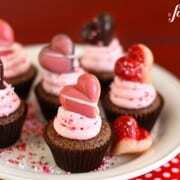 You turned an already delicious dessert into aother awesome treat, I love it! While I’d gladly enjoy the non-alcohoic version, I keep thinking dropping a scoop into a class of chardonney or champagne would be fantastic! I love Izze sodas – this would be fun too! Hope you’re having a great weekend! I’m definitely in for the sparkling wine version…love this! This sounds awesome! What a nice cool treat for this hot day! Sophisticated, yet so NOT! Just refreshing and fun…and, yes, definitely yummy! I’ve decided your raspberries are the prettiest I’ve ever seen! Love the look of these sparkling bubblies! I love that you used the sorbet you made for this. It is one of my favorite uses of sorbet and granita, and the Blackberry Joia is one of the kids’ favorites. So good! These sound fantastic! Great idea! Those Joie soda’s sound lovely and your raspberry sorbet bubblies look so refreshing.